How are Heirloom Tomatoes Different From Other Tomatoes? Heirloom tomatoes are always open-pollinated because they are self pollinating. Open pollination occurs when insects, birds, the wind, humans or other natural mechanisms aid in the pollination process. this makes open pollinated plants more genetically diverse and allows for a greater variation in plant populations. Heirloom tomatoes are developed slowly year-by-year adapting to the local conditions and climate. As long as the pollen of different varieties of tomatoes are not shared, the seed will remain true to type. 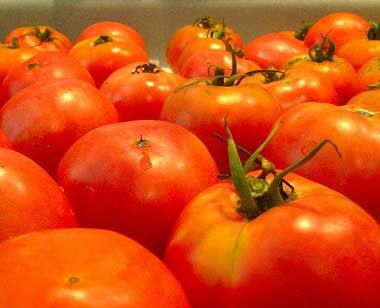 All heirloom tomatoes are open pollinated, but not all open pollinated tomatoes are heirlooms. Heirloom varieties must be over 50 years old in order for the tomato variety to be considered heirloom. Hybrid tomatoes, however, are pollinated using pollen from two different varieties and crossed by human intervention. Hybrid seeds must be purchased new every year in order to produce plants like the parent (original) plant. 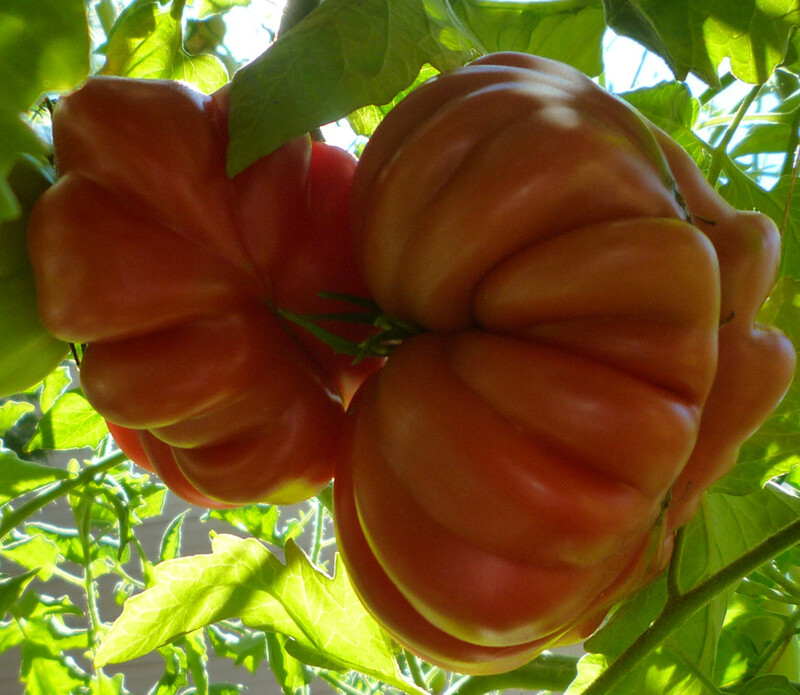 Hybrid tomatoes are never heirloom tomatoes. When choosing a type of heirloom tomato, another two terms that you will need to understand is determinate and indeterminate. Determinate tomatoes are tomatoes that produce a large crop all at once and then stops producing. 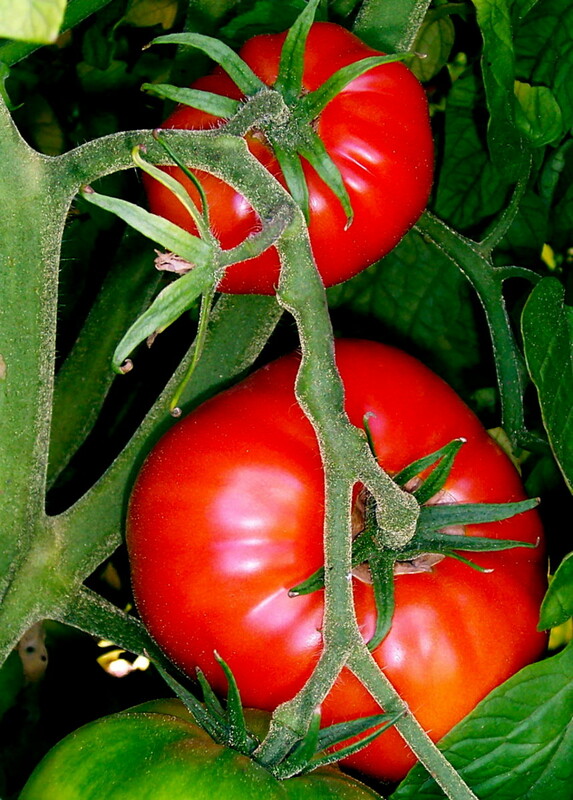 Indeterminate tomatoes are tomatoes that produce smaller crops at a time but continues to produce until frost, drought, or disease kills the plant. Most heirloom tomatoes are indeterminate tomatoes. 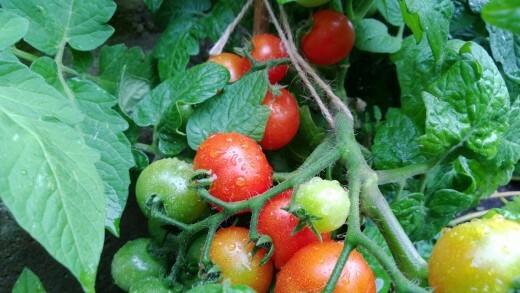 For best results, beginning gardeners should plant tomatoes from plants rather than from seed. Plant the plants after all danger of frost has passed. Planting Depth: Plant tomato seeds 1/4 inch deep in pots. When planting tomato transplants in garden, remove lower leaves and plant entire bare stem in shallow trench. Planting distance of plants from one another: If staking tomatoes-1-2 feet apart.(recommended). 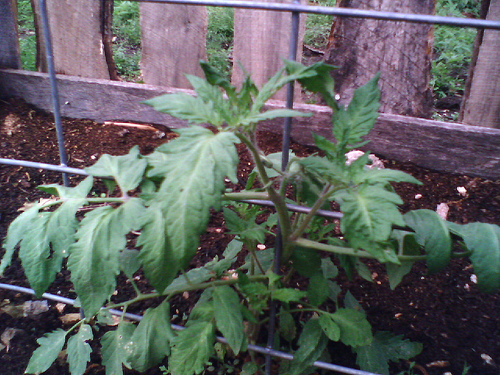 If allowing tomato plants to sprawl, 3-4 feet part. You can buy your heirloom tomato seeds from a commercial seed company which specializes in heirloom seeds or use a seed exchange or trading source in which to get your seeds. Tomato seeds' germination rate decreases as it gets older so it is best to use seed that is younger than 4 years old. Much older seed will germinate however if it is stored in a cool, dry, dark location. Use a seed starting soil mixture that is a combination of peat moss, vermiculite and perlite, Don't use garden soil as it tends to be too heavy. Do not use soils with high fertilizer content or add excess fertilizer to the mix. Dampen the soil to the point where it is damp like a wrung-out sponge, but not soaked or soggy. There are many different types of containers that you can in which to plant tomato plants. Just be sure that you have drainage in the bottom so that excess water can drain. Plant your plants no more than 6 weeks before the last frost date. Fill the container with dampened seed starting mix. then plant seeds about 1/8 inch deep. Press the mix lightly so that the seed has direct contact with the moist mix. Keep Tomato seed containers warm to the optimum temperature of 70-80F and they will germinate within 5 to 10 days. If temperatures are below 50F or abouve 95F, germination may not occur. Once germinated, tomato plants need lots of light. Either grow young plants in a heated greenhouse or under grow lights. The plants grow best at a temperature of about 65F. Plant outdoors two weeks after the last expected frost date. Plant in a sunny location with at least 6 hours of sunlight per day in well drained soil high in organic material. Sprinkle dried kelp powder at the bottom of a shallow trench. Remove all but the top leaves and lay out tomato plants in the trench. Water plant and cover with soil, then water again. Sprinkle some more kelp around plant. Also sprinkle dried egg shells and Diatomaceous earth around tomato plant to thwart damage from snails and cutworms. As the tomato grows, attach to some sort of support. Mulch around plants to prevent waterborne diseases. 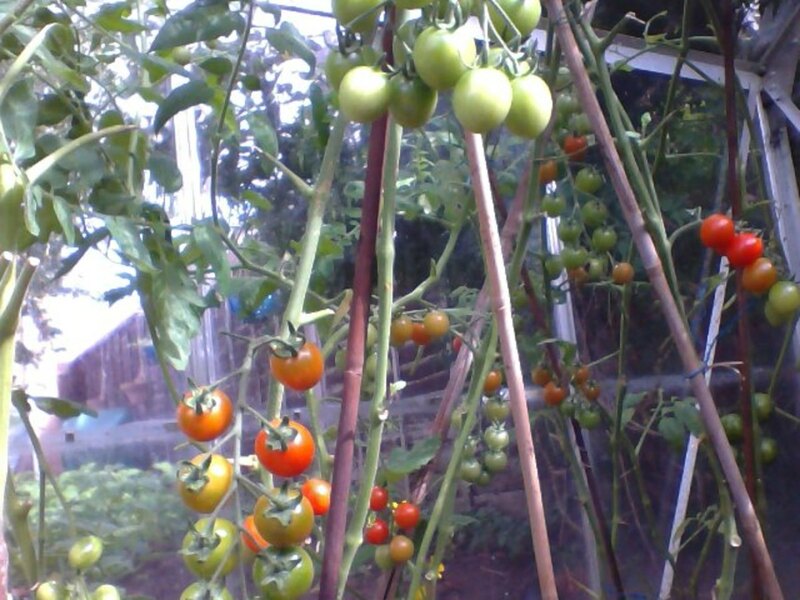 Water as much as necessary to ensure that your tomatoes are getting about one inch of water per week. Irregular watering can cause tomatoes to split. Pick tomatoes when the tomatoes have turned red on the vine (or yellow for yellow tomatoes, pink for pink varieties, and so forth). I recently learned that the way that my mother taught me to ripen green tomatoes is wrong. I learned that putting green tomatoes in the windowsill causes the tomato skins to become tough. A better way to ripen green tomatoes is to wrap them individually in newspaper or set them in a cardboard box. This will keep your tomatoes warm and allow them to release ethylene which is a chemical that commercial growers add artificially to ripen their tomatoes. The warmth and the gas will help hurry the ripening process. Choose tomatoes from your best looking plants. cut the tomatoes and scoop out the seeds along with the gelatinous liquid out of the tomato. Place what you have scooped out the the tomato into a small container and fill the container with water. Cover the container with a small piece of cheesecloth. Place container onto a sunny windowsill. The top of the liquid will look scummy, but the seeds will have separated from the gelatinous liquid. Allow the seeds and water mixture to ferment for a few days. This process helps destroy possible diseases harbored in the seeds. This process usually takes about 2-3 days. Remove the scum from the surface of the container then pour the rest of the contents into a sieve and rinse seeds with water several times. Be sure that the seeds are rinsed completely of the gelatinous slime. Remove as much of the water from the seeds as possible. Lay out a piece of waxed paper or a coffee filter on a cabinet where it won't be disturbed for a few days.Spread the seeds out in a single layer on the waxed paper or coffee filter. Turn the seeds over several times during the drying process over the next few days to ensure that the seeds are completely dried. The seeds are dry when they no longer stick to the drying surface or one another. Store tomato seeds either in plastic bags or paper envelopes. Word of warning If tomato seeds are stored in plastic bags, make sure that they are totally dry otherwise, the seeds will mold.Be sure to label the seeds as soon as you package them so that you will remember what seeds you have saved. Include on the package the variety and the date that they were put in the envelope Add description of the type of tomato that it is. For instance, you would want to add if it is a certain color type, if it were a paste or slicing tomato and whether it is a determinant or indeterminant tomato. Also include data concerning how long it took to produce tomatoes based on the day that you planted the tomatoes in the garden. Thanks for your comment, teaches12345. A very useful hub post for those who love tomatoes. I only wish I could do this in my backyard. Thanks for the reminder. That was one very important piece of information that did not make it into the article. Make sure you don't ever harvest green unless you absolutely have to. The most essential nutrients form during the final ripening - ON the vine. Hi Anna Marie Bowman! I totally understand how different areas of the country have different planting schedules. It always makes good sense to adjust information found in articles to your specific area. Great tips!! I have a slightly different planting schedule, but still useful! In addition to egg shells, I also put a bit of coffee grounds around my plants. They grow well down here, as long as they don't get too much sun. LongTimeMother, how different it is to live here where fall is now in the air. Enjoy your spring and starting your tomatoes! epbooks, You definitely wouldn't want to do all the work to grow tomatoes only to have the dog devour them or lose them to heat! I wish I could grow them for you! I wish I could grow them here in Vegas. If I tried to grow them indoors, I think my dogs would devour them and outside, they'd probably die in this climate. Love tomatoes though. Well-written hub! Act 3, I hope you do same heirloom tomato seeds this year! Nice hub. we've grown some heirlooms the past couple of years but haven't yet tried saving our own seeds.